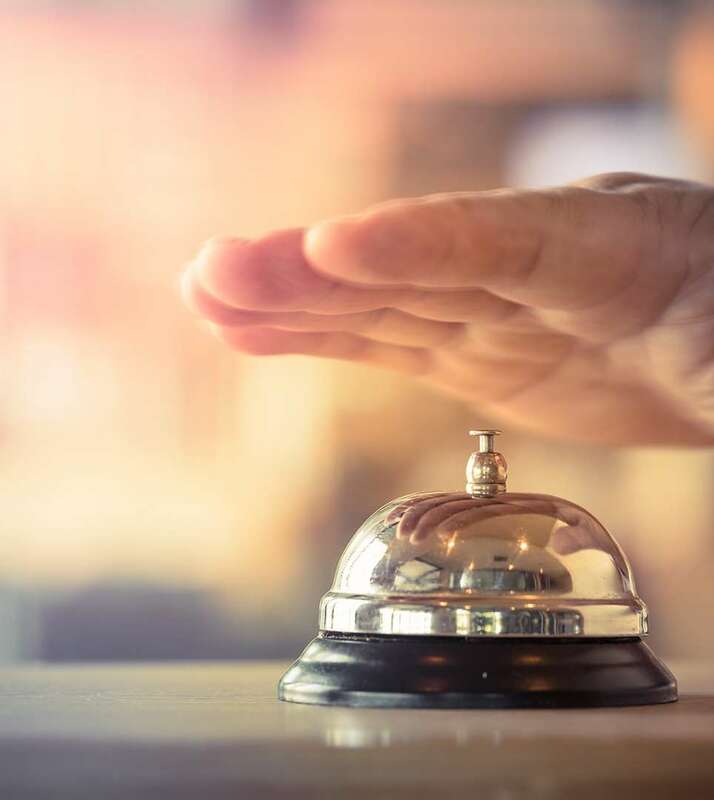 Early check-in is available upon request and availability at a fee of $25. Late check-out is also available upon request at a fee of $25. Please contact the front desk to inquire. 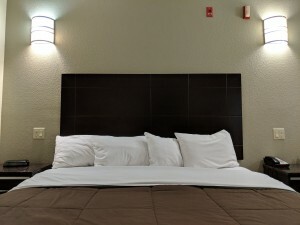 The air conditioned King Standard room has a large California King sized bed perfect for a couple. The King Standard has a desk and the bed has adjacent night stands with individual reading lamps. Each room has a flat screen LCD TV with over one hundred channels of programming. All of our rooms include newly remodelled full granite baths and a large vanity with a hair dryer. Most rooms have a view of the Sierra Nevada Mountains. Our air conditioned Double Queen Family Room offers two queen size beds which can accommodate a total of four persons comfortably. At 240 square feet, the Double Queen Family Room offers ample space for a small family to lounge after a long day in The Park. All rooms have newly remodelled full granite bath and vanity. The room offers a flat screen LCD TV with hundreds of channels of cable TV programming. 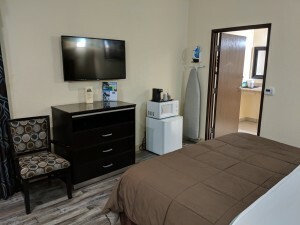 Each room also includes a microwave/refrigerator, coffee maker, iron/ironing board. Our air conditioned Double Queen Family Room offers two queen size beds which can accommodate a total of four persons comfortably. At 240 square feet, the Double Queen Family Room offers ample space for a small family to lounge after a long day in The Park. 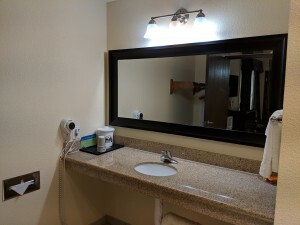 All rooms have newly remodeled full granite bath and vanity. 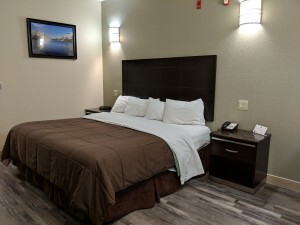 The room offers a flat screen LCD TV with hundreds of channels of cable TV programming. 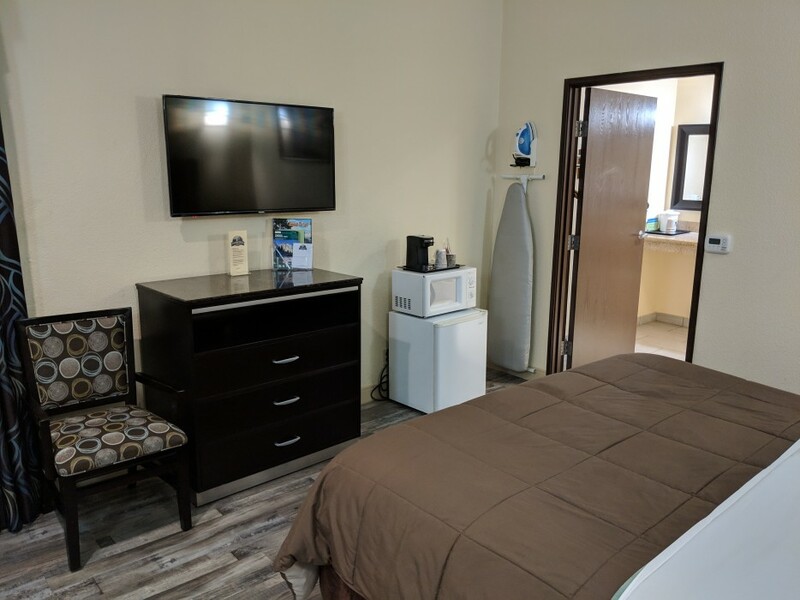 Each room also includes a microwave/refrigerator, coffee maker, iron/ironing board. The air conditioned King Standard room has a large California King sized bed perfect for a couple. The King Standard has a desk and the bed has adjacent night stands with individual reading lamps. Each room has a flatscreen LCD TV with over one hundred channels of programming. 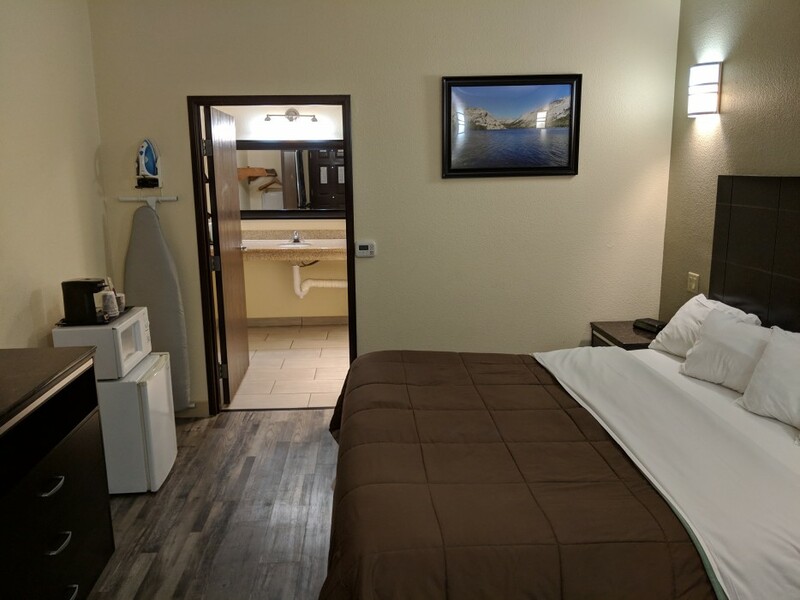 All of our rooms include newly remodeled full granite baths and a large vanity with a hair dryer. The King Handicap Room is a room with California King size bed with handicapped access in mind. 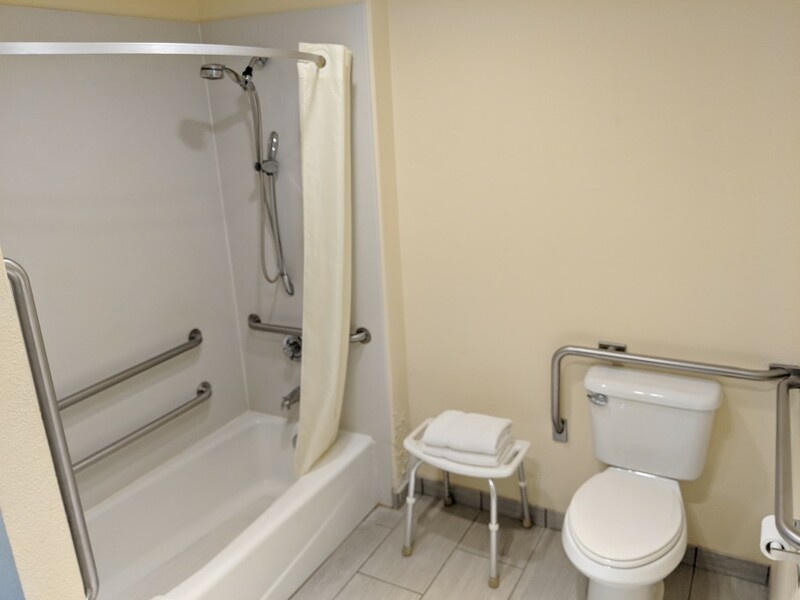 A giant bathroom with granite surround and the ADA compliant pull bars and fixtures including a hairdryer can accommodate wheelchair access. 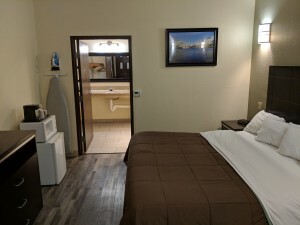 The King Handicap Room has a desk, flat screen TV, iron with ironing board, and microwave/refrigerator making it a perfect room for any handicapped individuals needing a perfect room to stay when visiting Yosemite National Park.